Plans to turn the historic site of former Prime Minister David Lloyd George's first political speech into apartments face opposition. Blaenau Ffestiniog Market Hall was built during the area's 19th Century slate boom, but it has fallen into dereliction over the last 40 years. Mossley Hill Investments Ltd said its plan would provide much-needed housing. Gwynedd councillor Annwen Daniels said there were fears the flats would be bought by outsiders and remain empty. Designed by Owen Morris of Porthmadog and built between 1861 and 1864 by Owen Roberts of Dolgareddu, Blaenau Ffestiniog Market Hall hosted some of the area's most important public events. Lloyd George - prime minister from 1916 to 1922 - lived at Llanystumdwy near Criccieth, and was 23 when he made his first major public speech at the hall in 1886. By the 1970s the building was empty and later faced demolition. 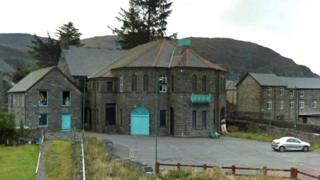 In the early 2000s, Menter y Moelwyn proposed turning the hall into an entertainment and community venue but failed to gain the necessary funding. Later plans to create an adventure sports and tourist information hub also failed to come to fruition. The Gloucestershire-based developers behind the housing plan claimed it would be a development with "a high quality of design in a sensitive location which will improve the site". Councillor Daniels, who represents the town's Bowydd a Rhiw ward, accepted there was a need for more social housing in the area but did not think the development was right. "The concern is that these apartments will remain empty and, as people from further afield are drawn to it, it could have a big impact on the culture and language," she told the Local Democracy Reporting Service. "This is such a historic building and I'd like to see something else developed there, such as a museum." Gwynedd Council's planning committee is expected to discuss the proposal in the coming months.